Dark Fantasy is just another way of saying Horror. Cyber & Sci-fi time again! There is so many exciting events running at the moment, it is really hard to resist to not buy everything you see at those events… Especially if it is events like Black Fair, Epiphany, ACCESS or The Fantasy Faire even. A few things I got nevertheless and they screamed cyberpunk/sci-fi for me 😉 I am still in my dark period with creating styles and pictures and the more I do, the more I enjoy it 🙂 With the dark and fantasy side of SL, I feel so much inspiration lately that I could post something every day if I would have the time to post process all my pictures. But since I wanted to use my easter holidays for learning new tricks in Photoshop, finishing pictures takes some time – even a little more with try and error these days *winks* The desire was to learn more about shading, lights and shadows and how they can be done realistic in Photoshop. I had some basic knowledge about that with a lot of layers, but I wanted to have a different result, something I saw a lot on flickr lately and that was why I forced myself to watch some tutorials and then try them instantly myself. I am not yet done completely with my research, but for today I was pretty satisfied how those new tips and ticks worked out. The mega, amazing “Aeon Cyber Corset” is one of the latest releases from A&Y. I love the creations of Anabel Crystal, owner and designer of A&Y. She has a very special way for sci-fi and cyberpunk creations and I do love her skills for vinyl and leather clothing. The corset you can find at the actual round of the ACCESS event, while there is a matching top/jacket at the black fair, which I will have to showcase soon too (I saw that after I finished my styling for this post already). The incredible “Voodoo” ears are as well a brand new release at the Black Fair. I love the ears of Eclipse Art Studio and Shina Shan never stop to amaze me with every new release. She always has another cool idea for the accessories of her ears. This time it was that little voodoo doll, that she added to the earlobes as an earring. The voodoo doll can be purchased as a single earring as well if you do not want to have the long elf ears ;). I love how easy you can tint the ears to match your skin and the possibility of all the tattoos you can add really make those ears so versatile. For the location I was trying first to set up something by myself, but this time I did not wanna come together as I desired it and so I made may way out to see if I could find a cyberpunk sim for my pictures. First I tried Cocoon, which is amazingly built but for non group members you have no rez rights and I wanted to use my pose stand this time. I need to go back another time as they really do have amazing spots for pictures and the sim rules even allow photographers as long as you wear an OOC titler, which you can find at the landing spot. I did remember, that Insilico had rezzing open at least for rezzing a pose stand top hop on. The auto-return kicks in after a few minutes, but as long as you sit on your stand, you are safe. Just do not get scared when you are done and stand up as the stand will be returned to your lost and found folder. After I could not decide about a perfect spot and had shot some random snaps, I did remember a few backdrops, that I got as a present from a friend not too long ago. The whole gacha set is amazing and I hope, I can find/win the ones I still miss in my collection. The “Cyberpunk Capsule *7*” was the perfect background for my look. For this round of The Black Fair, we have created Jane. A military inspired body suit that matches our newly released Michonne Boots at the Dubai Event. Jane is no nonsense up top and sexiness on the bottom with its long sleeves and high cut waist. Jane is a body suit that can serve you in many ways, all of them stylish! Jane comes with a HUD that offers you 10 muted colors for the fabric and 5 metal options. Jane is made to fit Lara, Hourglass, and Freya. We are back in Dubai! 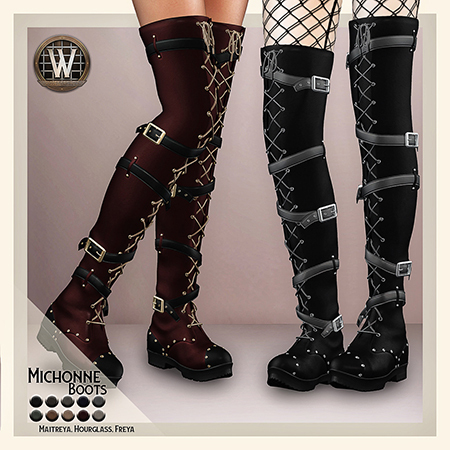 This time we have our Michonne Boots. This over the knee boot has no shortage of attitude! There are straps and buckles going all the way up, along with bold lacing. Metal studs add the perfect accent around the base of this boot as well as on the bits that secure the straps in place. Michonne is all business. No delicate high heels here. Just a thick, no nonsense flat base and attitude that goes for miles. Our Michonne Boots match the color and style of our Jane Body currently available at the Black Fair. The HUD contains the same colors and metals, so styling it up will be a breeze. Michonne fits Lara, Hourglass, and Freya. I do have the “First Aid” gacha set – made by Salt & Pepper – for a little while now and I was thinking all the time, what I could do with it. I saw many amazing posts in the typical latex, fetish style and thought, I have to do something different with that amazing set. As a side note… I LOVE the humor of Salt and if you take a look at the Epiphany Exclusive you will know why :p She made one of the infusion bags on the stands filled with coffee. THAT made my day. So often I was thinking about having coffee intravenously, when I was tired and had to work longer than expected 😉 I really do adore a good sense of humor! Ok so now back again to the whole set and a freaky idea how to showcase it without having the designer murder me. It is true that I always try to pull things away from the usual look, not because I think I am special, more to see what can be done with it and how much I can stretch out my fantasy and creativity, without looking the focus on the item. I do like to see thinks in different way and discover new possibilities. All the medical equipment I used for the pictures I found on Marketplace as well and I linked the store in the credits below the post like usual. The Cryo Tank, Is a very special item to me. It was made by Gryphon Vendetta, owner and designer of Poseidon & UNGOD. He filled that amazing tank with super cool and creepy poses, which I do have to highlight in another post again. The tank was so perfect for my science experiment idea, that I just had to sneak it in as a prop. It was so much fun to play with the whole set and like always it does hurt a little, to delete it. But I realized I cannot keep all my sets rezzed, as I will run out of prims really fast and can not build new sceneries *chuckles*. That enjoy as well and so it is a good compromise, to keep the pictures as a memory and let the actual sets go for new ones! For the latest round of eBENTO we have our Alannah thigh high boots. These laced up boots offer many points of interest from its platform base to its spiked heel. Alannah is accentuated with metal studs and sharp-edged parts all the way up your leg. It comes with a HUD that allows you 10 different texture choices and 6 different metal choices. Our Alannah boots are designed for Maitreya’s Lara, Slink’s Hourglass, and Belleza’s Freya. I’ve always been addicted to Tim Burton movies. Anyways if it was Beetlejuice, Edward Scissorhands, Sleepy Hollow or Sweeney Todd I do love them all and I saw them and all the others more than once! But I do love the most the “A Nightmare before Christmas” and the “Corpse Bride”. When I saw “A Nightmare before Christmas” the first time I instantly fell in love with Jack Skellington. I even had merchandising stuffs for my study equipment, bed linen and other stuffs in my room like poster and such. I do not why that clicked so bad but it did 😉 So I was so surprised when I was at CURELESS [+] and saw the Christmas Nightmare gacha – How I could miss that one?!? Certainly I had to have that no need to mention I never saw a more cool version for a female counter part of Jack Skellington. It is hard to explain sometimes that you are not in a bad or dangerous mood if you do dark pictures. I know it might be more common to do colorful country side pictures in SL, but I discover more and more that SL has a dark, artistic fashion corner as well and the more I try the more I really do love it. When I was trained as a model or blogger in the past, people did not approve my styles or pictures to much – not because they were bad quality, more because they were not norm or mainstream conform. Back in the days when I started it was important to have at least more than 50% mainstream and RL fashion trends covered somehow, but the longer I was blogging the more I developed a feeling away from deadline duties and so called “rules” to follow. I wanted more freedom to express myself, to experiment with more than just fashion and I was sick and tired of all the same pictures over and over, without soul but only fashion information stuffed. So I asked to be released off my blogger duties years ago and left blogger or sponsor groups, to have a fresh start and re-invent myself and my blogging/photography. For quite a while I did pictures without any sponsored designs and not for the purpose of design showcase only. I have to admit at that time it was needed to develop my picture skills and as well my blogging abilities. I thought a lot about what I felt and what I want to express, which I never did that intensive before. Before it was all about how many sponsors I can combine without looking like a clown, but still satisfy as many people and designers as I can with every post I did. It wasn’t bad all the time, but it is a different motivation and focus. Over the past 10 years of blogging, there was times where my pictures changed lightly, but most of the time they were sponsor focused only. After some time you feel a kinda burn out syndrome and past fun turns into work only.. and that killed my motivation at some point. I needed “fresh thoughts” if that makes sense. Pulling back was the right thing for me to do. For the past 1,5 years I started again to apply or take on sponsors/blogger duties, but not as many as I had before. I tried to not have just fashion pictures, I challenged myself to combine fashion with artsy touches and as well with feelings and emotions and sometimes even with a story behind the pictures. That as well made the decision easy, to not have one picture and a style card only, but to have a little picture series and sometimes a little story behind them, too. The Driftwood event is a new fantasy event that captures all the fantasy genres: light, dark, spooky or cute, you name it, Driftwood offers it! We are thrilled to be participating in the inaugural round. We have created the Phantom Mask, perfect for the darker side of your role play. 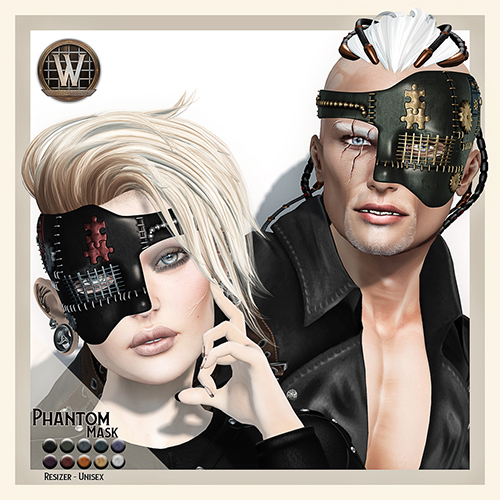 It is a unisex mask with a HUD that gives you 10 different texture options for all parts of the mask. It is also equipped with a resizer that makes our Phantom Mask work on any mesh head you like. 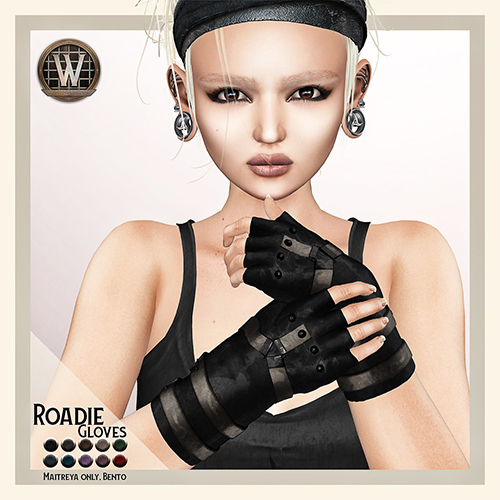 For this round of We ♥ RP we have created the Roadie Gloves. These fingerless Bento gloves are designed for Maitreya’s Lara. The Roadie Gloves are a great accessory for your SL wardrobe, if you are feeling a bit grungy, steampunky, dieselpunky, urban casual, or perhaps living the dream of being a crew person for your favorite band. Our Roadie Gloves come with a HUD that gives you 10 glove textures and 5 metals.